How much punishment does your phone's humble lock button take? You have to press it every time you check the time or your emails. Not for much longer, thanks to a new feature for Android devices. 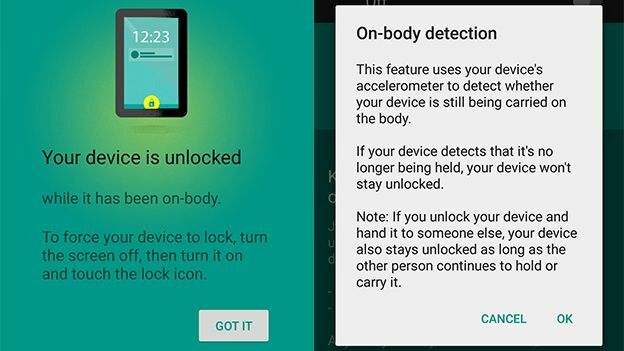 It's called 'on-body detection', and it keeps your phone unlocked as long as you have it on you. Using the accelerometer, it detects constant movement to know when it's in your hand, your pocket or in your bag, and when it's laid flat on a desk. Activate the feature, and once you unlock your phone at the start of the day, it will stay unlocked until you put it flat on a desk. No more pressing that poor button hundreds of times a day. Of course there is a security risk attached to it. If someone takes your phone out of your hand, pocket or bag, they won't have to guess a security code to unlock it. Though now networks have agreed a £100 cap on phone bills once your handset is stolen, the risk is somewhat less severe. It's not the first workaround to pressing the lock button. LG's 'tap to unlock' feature lets you access your handset by tapping the screen. The screen on Motorola's Moto E wakes up when you move it, showing the time and notifications, while Nokia's Glance screen is always on, showing the time. Still, it's a nifty-looking feature that should minimise wear and tear on that button. It will also save valuable milliseconds when you're checking if anyone has emailed you. It's rolling out now to Android devices, so keep a look out.